Several states, including California, have started a 'review' of the deal. They can't stop the deal but they can ask the feds to do so. AT&T gained (strong armed?) the support of a handful of state governors in favor of the deal, uh, all are Republicans except one. Who's getting the most new cell sites this year? Support comes from the AFL-CIO who might assume that T-Mobile employees would need to become unionized as AT&T employees. What are the chances anyone from T-Mobile will actually wind up working at AT&T, or even in the wireless business? AT&T had the great timing to apply for additional 700 MHz spectrum. Why would they need additional spectrum if the T-Mobile deal will provide them with "enough?" AT&T has over 100 registered Washington lobbyists. 'nuff said. While Congress has no direct role in approving the acquisition, some members have stated extreme opposition with words like, "I see no redeeming reason” for federal regulators to approve the transaction, "Not one." (Added at 4:15pm ET) The FCC has requested that AT&T must show why there is a need for so much additional spectrum and 49 other questions like how many "thousands of jobs will be created by the acquisition." This should lawyers in clover for months. We expect this to actually become humorous as we hear even more extreme positions. I'm waiting for Sarah Palin to chime in, "Don't all the phones belong to AT&T?" You watch. Everybody wants their wireless phone to have National coverage even if they never stray more than 100 miles from home. We want what we want, not what we need. During last week's Senate hearing for the AT&T/T-Mobile acquisition, it was brought out that AT&T competed with various wireless carriers at the local level providing a significant level of competition. The CEO of Cellular South, a carrier based primarily in Mississippi, argued that all cellular is now national based on customers no longer buying Regional plans. All carriers compete nationally and that puts smaller carriers at a disadvantage. I checked with the top 15 wireless carriers and found that indeed none of them offer Local or Regional plans any longer. Too bad. That was a great way to save on a wireless plan when your carrier needs to pay fewer roaming charges. Nobody cares. We all want universal coverage. Among the smaller carriers, "Unlimited" and "Data" plans are usually limited to a certain coverage area, either to their own network, or to that of a 'preferred' roaming p artner's network. As an example, nTelos, a regional carrier based in Virginia and surrounding states shows their voice coverage with a map of the US with most of the country colored in. If you select "Data" or "Unlimited" services you get a very different map. You get what looks like the Sprint network map, shown here. Yes, it is not Regional, but it isn't quite National, either. It's OK if it works for you. 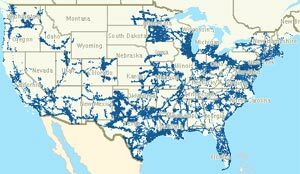 Many of the Unlimited wireless operators offer a value-priced plan with limited coverage, but even then, they normally need to include adjacent areas. There's no more interest in Regional and Local plans. After all, we want what we want. Sprint is offering up to $175 to customers who switch from other wireless carriers. The credit will "give customers a chance to try Sprint without having to worry about fees or charges for terminating their contracts with their current carriers," Sprint spokesman Lloyd Karnes said in an e-mail. The offer is $175 for business customers who switch and buy any Sprint phone; $125 for individual customers who buy a smartphone; or $75 for individuals who buy a low-end "feature phone." To get the credit, accounts must be ported from existing contracts, and they must remain active for 61 days. A two-year contract is required. The offer began May 4, Karnes said, but it wasn't widely reported until Thursday, when blog Spantechular posted an "ad." The blog said Sprint was targeting only T-Mobile customers, but Karnes said the offer is valid for those switching from any rival carrier. Sprint's consumer offer is good until June 23, and the corporate offer runs through July 23. Sprint has offered credits like this before, but they don't deny that the looming merger helped inspire the timing of this promotion. We would have hoped they would offer the average wireless user more, but with pro-rated ETF's, it may be worth it. Actually, after listening to Sprint CEO Dan Hesse at the Senate hearings, they should be encouraging people to join T-Mobile. Hesse called T-Mobile a partner in the trenches against the Big 2. He wants T-Mobile to survive. So do we, but we'll explain why they may not be able to on Monday. Here's an interesting play on getting a lower-priced AT&T plan: sign up with T-Mobile! We still recommend T-Mobile as a better value than the larger carriers, but if you feel that AT&T's acquisition of T-Mobile has any chance of happening, you could score a great T-Mobile plan now and keep it as an AT&T customer. The additional benefit is that unlike the recent Alltel takeover of some customers by AT&T, you can keep your T-Mobile GSM phone and your coverage should stay intact, although AT&T is known to shut down cell sites with duplicate coverage. We caught this clever idea from Consumer Reports who quoted AT&T sources as saying that T-Mobile customers, like Alltel customers, should be 'grandfathered' with their existing T-Mobile plans. Oddly, the article was based on a tip that Alltel customers who don't want to be absorbed into big, bad AT&T are allowed to abandon ship and join another network. Where Consumer Reports missed the mark is that they tell readers to join T-Mobile instead. While that's a good choice, most Alltel rural takeover customers don't have T-Mobile as an option. This could indeed be a nice way to get out of your expensive AT&T plan and into an economical plan with T-Mobile that will serve you well over the short term, and serve you even better if you do land in the AT&T corral. Yes, this makes T-Mobile an even better value than before...no matter what you think the future brings. Yesterday, Wireless Week reported that the FCC has received over 3,000 comments about the acquisition of T-Mobile by AT&T. So far, the comments are overwhelmingly against the hookup. One of the concerns is if the FCC will actually read all of those comments. While we advocated making your voice heard, it appears you have a much better chance at the state level. Sprint is actually doing just that by raising objections to the deal with the West Virginia state regulators (we can only guess they're approaching the states in reverse alphabetical order). Not only do we all have better access to state commissions, we can actually do so in person. If nothing else it might be a local call. These people have a good chance of being your neighbors instead of faceless federal paper pushers. We recently contacted over a dozen of our state legislators and found them surprisingly responsive to both phone calls and emails...it was 100%! I don't expect anyone here to drive down to speak to your state rep about a wireless merger, but there is a much better chance that your opinion, pro or con, will actually be heard...or read...down at the state capitol. We're looking for a sympathetic ear to insert our comments. We'll report if we find one.